Nearly 2.4 million students in the U.S. are currently receiving special education services for learning disabilities. That number is growing as parents, educators and physicians become more attuned to the signs of learning problems. Evidence has been uncovered that confirms what specialists have always believed—early intervention for learning disabilities can significantly improve a child’s outcome. What signs should you look for and where should you turn for help? Learning disabilities or learning differences fall into several categories—problems with reading, math, handwriting, motor skills and processing auditory or visual information. Reading problems: The largest concentration of learning disabilities falls into the category of reading difficulties. One of the most common forms is dyslexia. Treatment of dyslexia involves providing students with learning tools better suited to the way their brains are wired, for example using learning methods that rely on several senses (hearing, touch, sound) rather than solely on sight. Students with dyslexia often need extra time to complete tests and assignments and benefit from working one-on-one with an academic therapist. Others do well when they listen to taped lectures or do all their writing on a computer. No one approach works for every child, so it is important to tailor a system of learning tools that fit each individual’s needs. Math problems: The general term for life-long problems with math is dyscalculia. Like reading problems, the specifics and areas affected can vary widely from person to person. 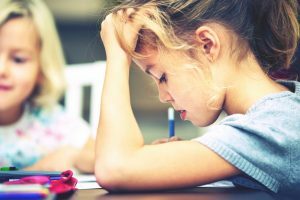 If a professional assessment finds your child has dyscalculia, the best approach is to supply him or her with alternative strategies for performing math operations. Each child’s strategy will be highly individualized and it’s often beneficial to find a tutor who can work to help your child develop a strategy and hone skills. Handwriting problems: Dysgraphia includes handwriting problems, trouble getting ideas down on paper in an organized way and poor spelling. Work with your child’s teacher to provide accommodations like reducing the amount of written work required, allowing more time for writing assignments and on tests, allowing keyboarding instead of hand written work and providing a note-taker or allowing the child to record classes. Your child may also benefit from working with an occupational therapist. Motor skill problems: Dyspraxia can affect both large and small motor skills. Children with this brain-based disorder may seem to be clumsy, have trouble with movements like jumping or skipping and have trouble with buttons and zippers or grasping pencils or crayons. The disorder can also affect speech, causing poor enunciation or trouble speaking at the right volume, speed or pitch. Children with dyspraxia may also be significantly more sensitive to noise and touch. Occupational, physical and speech therapy tailored for your child can help him or her build skills and find strategies to work around areas where they have trouble. Processing problems: Processing deficits cover a wide range of problems and can affect how a person receives and understands the information they take in through their senses, especially hearing and sight. The best strategy is to work with teachers and other specialists to find the set of tools that helps your child circumvent his or her problem areas. While having a learning disability may make learning tougher for a child, it’s important to focus on your children’s strengths and providing support to help make learning easier rather than letting their learning differences define them. If you or your pediatrician suspects that your child may have a learning issue, a health advisor can help you find experienced specialists who can diagnose your child’s learning disability and help your child build the skills and tools that can help him or her better manage the learning issue he or she faces.